The Ultimate Series 40 selection snack food vending machine is the choice for high volume locations. With 15 snack, 18 candy and snack cracker, 2 gum & mint and 5 pastry selections this vending machine has the selections and capacity a large location demands. Low cost and big features make this vending machine an easy choice for first time entrepreneurs or seasoned vending professionals. Large locations. The Ultimate 40 Select Snack Machine- The Ultimate Series 40 selection snack food vending machine is the choice for high volume locations. With 15 snack, 18 candy and snack cracker, 2 gum & mint and 5 pastry selections, this vending machine has the selections and capacity a large location demands. Low cost and big features make this vending machine an easy choice for first time entrepreneurs or seasoned vending professionals. If you are trying to expand your business or are already having a big place by you and are hoping to make the best use of the money and space, the ultimate 40 vending machine is a must buy. It will make picking and vending so much easier for you. 6 Flex Trays with adjustable heights in 1″ increments. 2 Year Parts Warranty. Shipping not included. iVend™ is an infrared light sensing unit consisting of a light emitter and receiver mounted on each side of the delivery box. During the first vend cycle, if a product is not sensed by a beam of the iVend™ system, the system waits one second then initiates a second vend cycle and rotates the helix until the product is sensed as dropped. If a product is still not sensed as dropped by the iVend™ system after a full rotation to the home position, the selection will be considered empty or sold out. The customer’s credit will be restored and will allow another selection to be made. The selection is then automatically reinstated for future vends. Re-establishes credit or refunds money. Machine operates conventionally in the event sensors are inoperative. Can operate in an outdoor environment and in low light conditions. Minimizes the vending of a “bonus” product. Tracks number of sensed vends, helping operator identify improper loading or spiral choice. Pricing: Individual From $0 To $999.95. Dimensions: 72″H x 41″W x 34.25″D. Capacity: 630 snacks (depending upon tray configuration). Our telephone technical support and parts team will be happy to assist you with any issue you may have Monday – Friday 8:00am – 5:00pm EST. 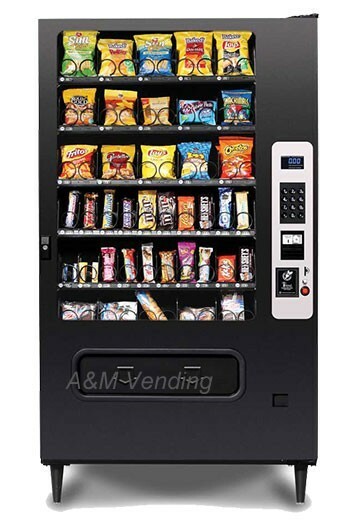 The AMS 39 Snack machine has a better warranty with a better price.